Our classic escorted tours take you from east to west, north to south, with a new hotel as you base every day or so. Alternatively, you’ll fit in lots of sightseeing on our relaxed tours, but you’ll do it from the comfort of just one or two hotels. An intricately designed series of journeys for those who wish to see the iconic sites and magnificent treasures on a fully-inclusive excellent value group tour. You’ll travel with the assurance that all your arrangements are taken care of – from international flights, visas, accommodation; and all the touring listed on your itinerary. You will be accompanied by our industry-leading National Escorts whose unparalleled knowledge and talent will turn your holiday into a magical and unforgettable experience. Ranging from nine day trips that focus on the main attractions to more comprehensive itineraries exploring lesser-visited regions, our classic tours offer the opportunity to tick all the big sights of your list. It's all about experiences with our Immerse Yourself touring range. Delving deeper into the local culture, understanding its quirkiness and getting off the beaten track. 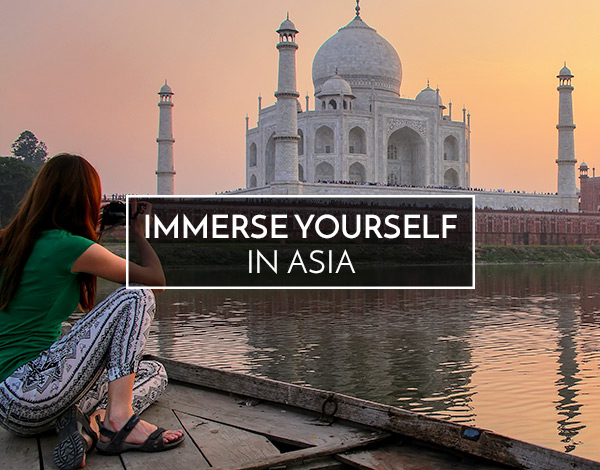 Plus, depending on which tour you choose, you'll either take part in exciting, active adventures or enjoy a little more free time to discover Asia, your way. WHY CHOOSE AN IMMERSE YOURSELF TOUR? Plus, throughout November, your partner flies free on many tours within our Immerse range. Or if you're a solo traveller, receive 50% off your flight! The countdown for Christmas has begun, but have you found the perfect gift for your loved ones? At Wendy Wu Tours, we believe the very best gift is the gift of travel. Whether it's Vietnam, India, Japan, Sri Lanka or China that's next in your sights, there's a wealth of unforgettable experiences and memorable moments available in 2018. There's nothing quite like experiencing a country just as the locals do. Spend time with Kerala's residents, as they cook authentic south Indian home-style dishes for you to indulge in! Wake up to the sun rising over the picturesque emerald waters of Vietnam's Halong Bay. Take it all in as your slow-paced ship weaves through the striking karst peaks. One of Japan's most striking natural wonders, Mount Fuji is in fact the country's tallest mountain and active volcano. You can even admire its inspiring peak all the way from Tokyo! The Elephant Transit in Home, Sri Lanka is a special place. Help care for sick or orphaned elephants before they're released back into the wild. Supported by the Born Free Foundation, this is the place to visit, whether you're an elephant fan or not! China's most iconic sight, walking on this mighty structure can only be one of the most exciting, magnificent and unbelievable things you'll ever do! 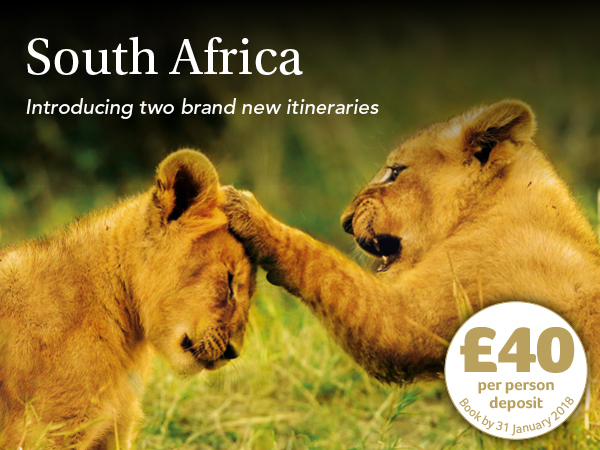 South Africa really is the perfect destination for an escorted tour and holiday of a lifetime. In the latest edition of our flagship worldwide brochure, we launched two new exciting tours to this diverse and adventurous country. First up is Contrasts of the Cape, a spectacular journey along the magnificent Garden Route which unique to Titan, visits the lesser known gem of Graaff-Reinet - a charming little town rich in arts and culture set in South Africa’s desert region. Here marks the gateway to the Valley of Desolation, making an unforgettable location to view the magnificent sunset. For wildlife enthusiasts, Kariega Game Reserve is an exciting highlight as we include an incredible four game drives, providing ample opportunities to spot the ‘big five’. Our second tour is The Garden Province of KwaZulu-Natal with Lesotho, a must for anyone wanting to discover traditional Zulu culture with a combination of the region’s beautiful and diverse nature. 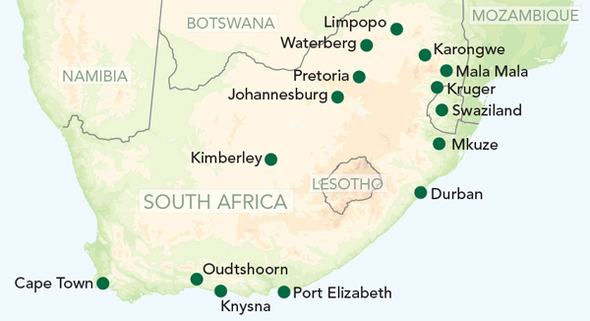 This small group tour will discover the region of KwaZulu Natal, from the India Ocean at Selbourne to the Dizzy heights of the Drakensberg Mountains, as well as the land locked kingdom of Lesotho - the heart of tribal Africa. For the ultimate touring experience, why not visit Latin America? There's much to discover here, such as wonders of the world, ancient Incan cities, colourful neighbourhoods and much more. Book with Mercury, fly with LATAM and enjoy an experience you will never forget. Changing leaves, wildlife, apple cider – the fall season is in full swing across the pond. And nowhere does autumn better than these north-eastern states. Traditional clapboard houses are decorated with autumnal wreaths, with displays of pumpkins and squash on front porches. Farmers take advantage of bumper fruit harvests, churning out deliciously sweet ciders, apple doughnuts and cranberry chutneys. Forests of beech and maple turn glorious shades of red, gold and orange – and if you look closely, you might spot a few wild local residents (squirrels, birdlife and perhaps even a moose or two). It’s a beautiful region to explore at this time of year – our ‘Best of New England in the Fall’ tour spotlights some of the prettiest parts. We’ll start and end in Boston, journeying in a loop that takes in Cape Cod, Mystic, Woodstock, the White Mountains and much more. Along the way, we’ll enjoy maple syrup tastings, visits to charming historic towns and, of course, plenty of stops to admire the fall foliage. Travelling through five states, soak up postcard-worthy views at every turn, from historic lighthouses and steeple-topped churches, to wooden covered bridges and rows of classic clapboard houses. Join us on an adventure to China or Japan and find yourself immersed in the culture and magic of these spectacular destinations before flying home in Business Class for just £99pp! Meet the bowing deer of Nara, explore futuristic cities and discover the magnificent Mount Fuji in Japan, or uncover bustling Beijing, visit the Giant Pandas of Chengdu and hike along the snaking Great Wall in China - whatever your dream trip may be, make your journey home as extraordinary as the tour itself with our fantastic Business Class Upgrade offer when you book by 20 Jan 2019! Just one photo can bring memories of your holiday flooding back. A spectacular photo can capture the mood of a whole destination. If you love photography, here are our favourite destinations in the world for keeping your lens busy, from mighty sand dunes and stunning landscapes to quirky wildlife. As you stand in the clouds above Machu Picchu, take in the detail and texture below, the dramatic mountains and the changing light. Our tip is to go in low season and enter the citadel at the end of the day as it empties to get the best pictures, minus the crowds. No place in the world is better for taking pictures of wildlife. The islands are home to hordes of endemic species, such as the sun-basking marine iguana. We highly recommend taking a GoPro to capture underwater footage – the sealions can be very playful! One of Saint Lucia's most iconic sights, the emerald-coloured Twin Pitons are volcanic plugs rising from the coast, creating a dramatic backdrop to the town of Soufriere. Stay at Jade Mountain and your open-air suite will have the perfect view of the Pitons from your private pool. Epic dunes; cheetahs roaming through national parks; and decaying shipwrecks buried in the sand on the Skeleton Coast – Namibia is full of camera-worthy opportunities. One of our favourites is the eerie petrified forest, where scorched trees contrast against orange sand and blue skies. The energy and relentless pace of Hanoi is intoxicating. One of the best spots to capture snaps of the traffic is from the City View Café, which overlooks one of the busiest intersections on the edge of the Old Quarter. It's chaotic - but brilliant - especially at night. Rajasthan is a photographer's dream, home to the famous pink city of Jaipur, the stunning Thar Desert and the majestic Bengal Tigers of Ranthambore National Park. Holi, the 'festival of colour' is spectacular to photograph – but beware of flying coloured powder and your camera! Rich in emerald-coloured landscapes, fresh local cuisine and exciting wildlife encounters, exploring Sri Lanka is a true adventure. Indulge in a more intimate experience with Uga Escapes' boutique resorts and hotels across this stunning island in the Indian Ocean. A beautifully-restored colonial mansion in Anuradhapura, framed by paddy fields and a lake; with villas boasting a plunge pool and sun terrace. Close to Yala National Park where elephants roam free, stay in a spacious cabin amongst the sand dunes and relax in your private plunge pool. Good things come in small packages and that's absolutely the case with the island of Sri Lanka. You'll find spectacular sights that continually inspire people to visit. It has everything from rugged coastlines and tea plantations to dazzling rainforests and exciting wildlife. Experience more of what Sri Lanka has to offer and save up to £382 per couple with a combined stay at three hotels. Discovering a new destination and delving into what makes it so special is one of the most exciting experiences imaginable. We bring you a collection of our holidays featuring the hottest and trendiest destinations for 2018. The sun-soaked Mediterranean island of Malta boasts a glorious history and its 16th-century citadel capital, the UNESCO World Heritage city of Valletta, built by the Knights of St John both as a fortress and a spectacular architectural celebration, is one of the European Capitals of Culture in 2018. In 2008, Liverpool reigned as the European Capital of Culture making it the 'must see' destination in the UK. For 2018, Liverpool has launched an '18 for 2018' campaign showcasing the city’s culture, heritage, UNESCO-listed icons and award-winning exhibitions, which also includes the Terracotta Warriors returning to the UK shores after 10 years at Liverpool's World Museum. With its incomparable wildlife and unique wild places, Botswana continues to lure visitors. The Okavango Delta is like no other, a pristine wetland paradise while the Chobe River region is famed for its dense concentration of breathtaking wildlife and safari adventures. And, as it's set to be a big year for Prince Harry, Botswana will be the hot topic of many conversations as this was where he camped out under the stars with Meghan Markle and a country that has been close to his heart since he visited at the age of 13. A lucrative part of the America's musical playground, Nashville is the Country Music Capital of the World. Home to the Country Music Hall of Fame, it’s also renowned for the Grand Ole Opry, America's longest-running scheduled show (it’s never missed a Saturday performance since it was first broadcast on radio in 1925!). And for those looking to delve deeper into the Southern music scene, Nashville can be the perfect start point for a classic road trip to Elvis Presley’s Memphis and ‘The Big Easy’, New Orleans. Located off Ecuador’s coast, the Galapagos Islands are an archipelago home to colourful crabs, swimming lizards, penguins, blue-footed boobies, and the famed giant tortoises. These are the islands visited by the young Charles Darwin in 1835, and inspired him to write and publish his 'On the Origin of Species' theory of evolution. 2019 marks the 50th anniversary of Galapagos being managed as a national park and 40 years since it was declared a UNESCO World Heritage Site. Tourism is on the up again with more visitors flocking to the turquoise coasts, ancient cities and picture-perfect fishing villages. There is no better time or place to discover the exotic blend of eastern and western cultures. The thought of travelling on your own can seem daunting, so why not travel with us? We have a collection of tours and cruises designed exclusively for solo travellers – with no single supplement to pay. Discover the world with like-minded people, enjoy a twin or double room all to yourself, and perhaps make a new friend or two – safe in the knowledge a dedicated tour manager is with you all the way to ensure you have the holiday of a lifetime. Every solo holiday includes a welcome dinner and drinks reception so you can meet your fellow travellers. We also offer regional departures across the UK and your tour manager, or a member of our team, will meet you at your chosen airport, or at London St Pancras when travelling by Eurostar. With a wide range of tours, from a city break in Paris or Bruges to a 22-day adventure in New Zealand, as well as river and yacht cruises, there’s something for everyone. Whether it’s glimpsing snow monkeys in a Japanese onsen or seeing a tiger prowling through the jungle, witnessing wildlife in its natural habitat is always a special moment. We’ve divided our Walk on the Wild Side online guide into six sections to help you find the right experience for you. The African Safari details classic ‘Big Five’ safari itineraries and holidays including safari elements. Asian Encounters includes information about tiger reserves in India and orang-utan sanctuaries in Borneo, while Up Close and Personal focuses on holidays that allow you to get eye-to-eye with gorillas in Uganda and bears in North America. Spot whales breaching, bald eagles gliding and dolphins playing from a cruise along the spectacular Alaskan coastline. Product Manager Phil shares his experience of coming face-to-face with mountain gorillas on a trip to Uganda. A day in the life of a safari guide at Mala Mala, one of South Africa’s oldest private game reserves. Icebergs, penguins, whales and seals – a personal account of a cruise to the bottom of the world. Top tips on capturing wildlife on camera, whether you’re using an advanced SLR or a smartphone. Dreaming of a safari adventure? Read our insider guide to find out where to go and what to pack. Titan have been specialising in escorted tours and cruises for more than 40 years now, taking travellers on adventures to almost 100 countries across the globe. With decades of experience under our belt, you can rest assured that you’re in safe hands, wherever you choose to travel with us. We have a passion and dedication for delivering exceptional experiences, from our tour managers to our VIP drivers who take you to and from the airport. We also have fantastic behind-the scenes teams who craft our itineraries, plus expert travel advisors who know our holidays inside out. All working closely together to ensure your holiday runs as seamlessly as possible. We might not be the cheapest out there - but that’s because we include a whole lot up front, so you’re not left paying the extra while you’re away. On the majority of holidays, a host of excursions will be included to allow you to really get the most out of your trip, as well as a number of meals, giving you fantastic value for money. We know it’s frustrating when you see something you’ve just bought on sale for a fraction of the price you paid. That’s why we have our Price Promise - if we lower the price of your holiday you’ll get the difference back (in cash). Our holidays include ABTA and, where flights are included, ATOL protection, and are provided in accordance with the Package Travel Arrangements Regulations 2018. For further details, see our website. Whether you’re looking for a classic tour, a river cruise, a rail journey or perhaps a solo adventure, we’re sure you’ll find something to suit. Titan ‘classics’, these holidays introduce a destination’s highlights in the company of an expert tour manager. Adventures limited to a maximum of 24 guests, allowing for a more intimate experience. Rail journeys Iconic adventures by rail, including the Venice Simplon-Orient-Express and Rocky Mountaineer. Holidays designed to let you delve deeper into your destination, staying in just one or two locations. Laid-back voyages along scenic waterways, including sailings aboard our two exclusive-to-Titan ships. Coastal cruises across the world - from Antarctica to Zadar - on a range of cruise lines. From Scotland to the south coast, these great-value holidays showcase our own shores. Festive getaways ranging from Christmas market cruises to winter-sun escapes. Did you spot that two of our incredible destinations have been featured in the Lonely Planet Best in Travel 2019 Top Countries list? Beautiful Sri Lanka came out on top and nestled comfortably alongside it was magical Indonesia. Read on to find out what makes these countries so extraordinary and make 2019 a year to remember as you explore two of the best locations in the world on a Wendy Wu Tour. See the best of Sri Lanka on a Wendy Wu Tour, with animal lovers spotting leopards and elephants on an unforgettable trip through Yala National Park, history buffs losing themselves in eight breathtaking UNESCO World Heritage Sites, foodies rejoicing as they sample delicious cuisine and those looking for relaxation retiring to one of many paradisiacal beaches that line the coast. Infinite adventures await in Indonesia, with this tropical paradise bursting with white sand beaches, lush jungle and vibrant cities. The nature is hard to rival, from the cloud-swept lunar landscape of over 100 volcanoes to spotting the myth-inspiring Komodo Dragons or ethereal green sea turtles. Indonesia offers a never-ending myriad of colour, diversity and history to intrigue and enchant.